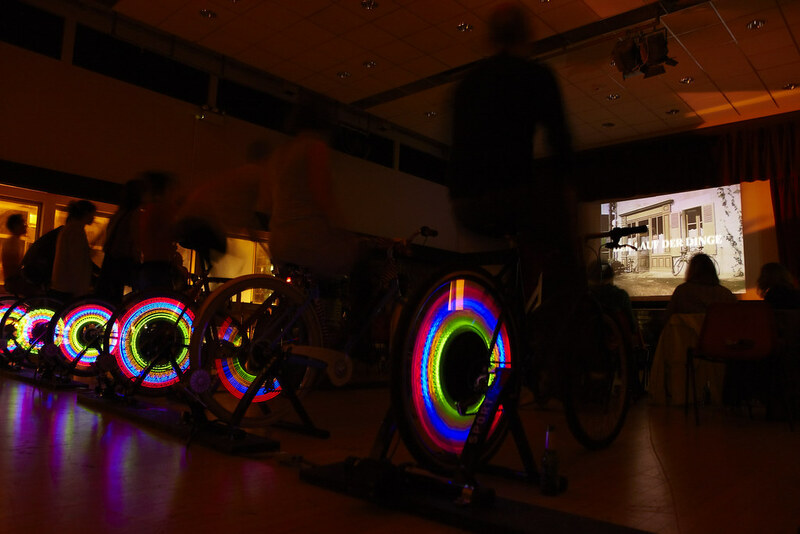 Once a critical mass assembled we faded the music (made audible through electricity generated by early cyclists) and cued the carefully curated screening programme. A looped Jaques Tati sample (the autonomous bicycle scene) from Jour da fete (1949) gave way to a 13min slice from Fischli and Weiss' classic Der lauf der Dinge (1988). In the video, mechanical and material energy transfer are made present through a spectacular, and funny, chain of cause and effect. Der lauf der Dinge perfectly set the scene for the 70min The Big Melt (2013). The moving image document by Martin Wallace and Jarvis Cocker, combines fragments from the 100 years of film footage digitised in the BFI National Archive, with a score recorded live at the Crucible Theatre on the opening night of Sheffield Doc/Fest in June 2013. The Big Melt narrates a story of steel - the processes, machinery, factories, labour, forms of organisation, destruction and waste necessary for its production. Images of enormous factories, terrifying machines, vast furnaces and mountains of materials are interwoven with representations of the lives of the men and women who made, and continue to make steel. In our programme,The Big Melt acts as a metaphor (bright ribbons of liquid steel, cascades of sparks, roaring fires, leaping flames are literally burnt into the black and white footage) for the role sunlight plays in energy (carbon is congealed sunlight) and what we choose to do with it. 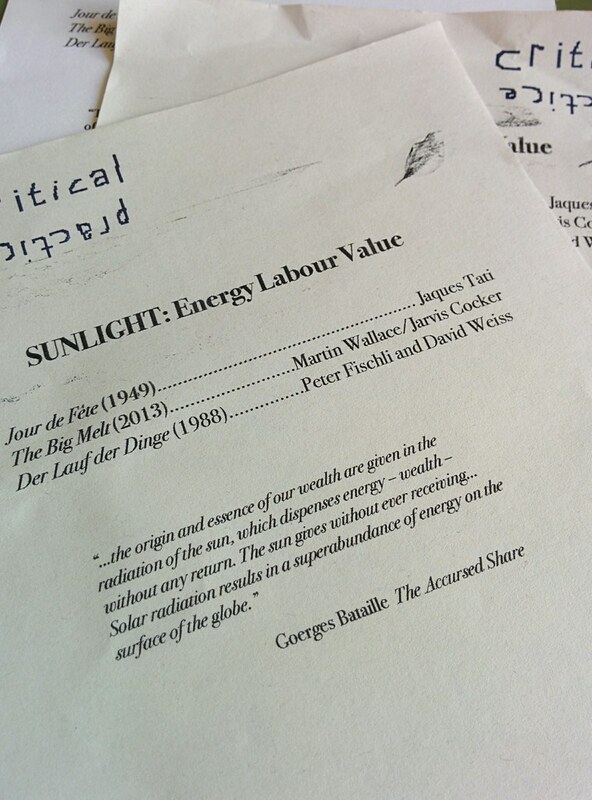 SUNLIGHT: energy labour value is the fourth in Critical Practice’s series Differently Screening; the series aims to explore contemporary forms of moving image use, and to end spectatorship. Critical Practice is a cluster of individual artists, researchers, academics and others who aim to support critical practice within art, the fields of culture and organisation. Participants were invited to bring a personal light source (a torch, mobile device, etc) that didn't require mains electricity. Beer and bread were on offer, to provide the carbohydrates (more congealed sunlight?) necessary to aid peddling. It was hard. It was fun, and it was provocative. Critical practice at its finest. Visit: Critical Practice, or see related projects Anthropocene walk 1, or Open Cinema or #TransActing.